APP CONTROLLED & WIRELESS CONNECTION: Free download the app named "LED BLE" from QR code or apple store, perfectly compatible with iPhone and Android. Note that turn on the Bluetooth first, make sure connect to the light strips via Bluetooth, and then open the app to choose modes you like. Help you create a romantic and beautiful atmosphere. MULTI COLOR & MUSIC CONTROL: Over 16 colors and different tones for selection(Blinking, Flashing, Brightness, Etc), you can create your own unique color. 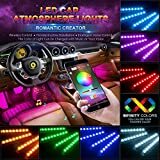 The interior car lights will sync to music on your phone or any sound captured from microphone, and then the lights will change their colors following the music rhythm, making you feel like sitting in a music show scene. EASY INSTALLATION & USE : Plug and play without wiring. First plugged into car cigarette lighter, then peel the back 3M double-sided tape, paste the light strips on the car floor. Finally press on the red cigarette lighter switch, then you can start to use. This cigarette lighter plug has switch and indicator light, built-in fuse, effectively protect the vehicle lights. PERFECT CAR DECORATION: Sound sensitive function, the color will change according to music rhythm. 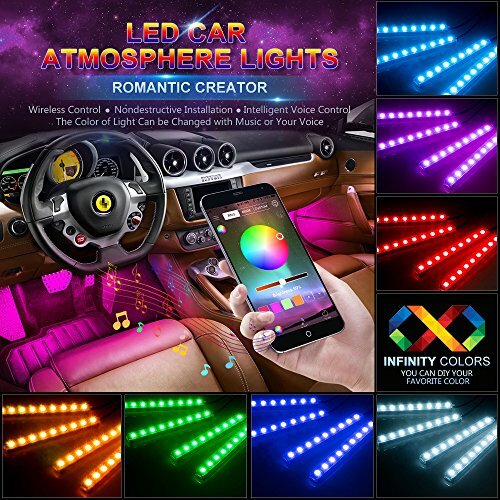 Great product to dress up your car, perfect enhancement not only for upgrading your car but also increase safety of driving in daytime and nighttime. 【Important Note】All the Wsiiroon products come with life time warranty and five stars customer satisfied guarantee, please contact us directly if you have any question about our products. Wsiiroon car led lights ONLY suitable for all cars with DC 12V power.